Cost to remove a wasp nest varies greatly by region (and even by zip code). Get free estimates from animal/pest control specialists in your city. Cost to remove a wasp nest varies greatly by region (and even by zip code). The average cost of remove a wasp nest is $325 - $450. How much does it cost to remove a wasp nest? According to National Geographic, a wasp is a widely diverse insect that has over 30,000 species. Often times, people may confuse them with bees, but they are distinctly different insects with different looks and behaviors. Wasps have a pointed abdomen whereas a bee's abdomen is more rounded. Wasps also have a very narrow waist and come in a variety of colors from browns and yellow to reds and even blues. The brighter colored wasps tend to be the ones that sting; and wasps can sting multiple times, whereas bees can only sting once before dying. Because their nests, habits, and removal are so different, you will need to determine what type of infestation you have; this guide will focus solely on wasp removal. There are several factors affecting the cost of wasp removal, including the type of wasp, location of the nest, danger to people and pets, and the size of the infestation. The average cost to remove a wasp nest ranges from $325-$450 or more depending on the location of the nest and the amount of carpentry repair that may need to be done afterward. There are over 30,000 species of wasps, but the most common types of wasps in North America are yellow jackets, paper wasps, and bald-faced hornets. Yellow jackets are identified by their bright yellow and black coloring. These wasps can nest underground, in hollow trees, and in cracks or crevices. Paper wasps build paper-like nests that are honeycombed, typically hanging from a tree, bush, or the eaves 1 of a building. The bald-faced hornets are larger and black & white. They build nests similar to paper wasps only much larger, up to 3 feet tall. Wasps can be a nuisance, especially if they build their nest under your eaves 1 or near an entrance to your house. Aside from the pain of a sting, a wasp sting allergy can be very dangerous. As many as 70% of stings in North America are inflicted by the yellow jacket, but all wasps can sting, often when not provoked. If the wasp nest is out in the back yard, high out of reach you can probably leave it; wasps do have some benefits to the area. The venom injected during a wasp sting is very poisonous to people who have a wasp allergy. Symptoms can range from a small, puffy, red area, to a large swelling of the limb, to anaphylaxis, an extreme condition that needs immediate medical care. People that have an extreme allergy to wasp stings typically carry an Epipen, a measured shot of epinephrine that will fight the venom while you are being taken to the hospital. An Epipen is not a replacement for medical attention; it is a means to buy you time to get to the hospital. A professional exterminator will come to your home and conduct an inspection by identifying the type of wasp that is troubling you. Upon that identification, they will determine the type of treatment needed and will use an arsenal of dust and aerosol products that are designed to kill the type of wasp you have. The professional has the equipment, products, and know-how to rid your home of wasps. To begin with, the exterminator will wear the appropriate protective gear to prevent receiving any stings. They will also try to isolate the nest. For nests that are in the ground, such as yellow jackets, the exterminator will use a dusting method. The dust should contain permethrin, which will stick to the wasps so they will carry it deep into the nest and kill the others inside. For hanging nests such as paper wasps and bald-faced hornets, the exterminator will use an aerosol that contains tetramethrin and prallethrin. Costs for killing the wasps start around $85 regardless of method. If the wasps are inside your home, the nest may need to be removed in addition to the extermination, which will cost more. Wasps may get inside your home through small cracks or crevices. The exterminator may utilize a special vacuum that will fit into these small openings and vacuum out the wasps. In fact, in some cases the vacuumed wasps could be sold to pharmaceutical companies who make the antidote for wasp stings. Typical exterminator costs will run between $85-$250. This covers the initial inspection and treatment, including the use of chemical dusts, aerosols, and liquids to treat the nest in order to kill the nesting adults. After the wasps are killed, the nest can be removed, usually included in the cost of the treatment, however, you may need to pay up to $100 more if the wasps are in a difficult to reach location. If you suspect you have wasps inside the walls of your home, an exterminator can also drill small holes in the walls and apply a dust. This treatment can cost $150-$1,000 depending on how extensive the wasp infestation is and how many holes they need to drill. 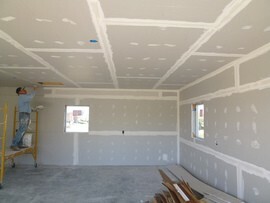 The holes can be easily repaired, using a drywall 2 repair method; a new sheet of drywall 2 may be necessary at $9, plus the cost of installation at around $30 a sheet to finish the job. If the wasps have built an extremely large nest in your walls, you may require more carpentry work to remove it and repair the damage. A carpenter charges around $70 an hour, and repair work may take a minimum of three to four hours to do. There are several things you can do to deter wasps from nesting near your home. Remove food sources such as pet food and open garbage containers, and cover compost piles. Avoid swatting. A squashed wasp releases a pheromone which attracts other nearby wasps. Avoid wearing bright colors or floral patterns; you don't want to look like a big flower with nectar. Minimize use of perfumes and other sweet scents as wasps are attracted to sweet smells, especially later in the summer. Bee Free Wasp Deterrent. Based on the premise that wasps do not build near other wasp nests, this deterrent looks like a wasp nest, but is more similar to a Chinese lantern that is gray and more nest shaped. It is easy to hang and will deter wasps from building nests under your eaves 1. Glass Wasp Trap. This is a pretty-colored container that you fill with some water and a lure. The wasps fly up through the bottom and are trapped, eventually drowning in the water. The degree of infestation will also help determine if you require follow-up visits by the exterminator at a cost of $85-$250, particularly if the wasps are inside the walls of your home. The two best times for extermination are in the spring just as they are starting to build their nests, and in the fall to get any leftovers that were not killed in the first go-round. Believe it or not, there are some benefits to having wasps around. 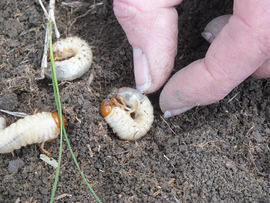 They eat crop destroying bugs like grub 3, flies, crickets, caterpillars, and the like. In addition, they carry pollen, which is important to plant growth. Do not disturb the wasp nest in any way such as hitting, burning, or flooding. Each of these attempt will only lead to the wasps getting angry and attacking you. You would risk multiple stings, damage to your home from burns, or water damage. The best choice is to call a professional exterminator. How much does it cost to get rid of a wasp nest? The average cost of removing a nest from an easy to reach location is between $325 and $450. Costs will go up as high as $1,000 if the nest is difficult to reach or if it requires carpentry to repair the area. How do you kill a wasp? Wasps are usually killed with a mixture of dust and aerosol chemicals designed to target the type of wasp that you have in your home. In some cases, they may also be vacuumed up. Getting rid of wasps is usually a multi-step process. Removing the nest as well as using dust or aerosol chemicals and vacuuming up large amounts of the pests are the most commonly used methods. How do you remove a bee's nest? Bee’s nests are removed by opening up walls or cavities to reach the nest, smoking to quiet the bees, then prying the nest from its location. In many cases, the nest may be left intact and the bees transported to a new location. In some hard to reach areas, the nest may need to be dismantled to remove it. Wasp nests are usually removed by either dusting, spraying, or vacuuming out the wasps to ensure they are dead. The nest can now be easily pulled from its location, provided that it is of the paper variety. How many wasps are in a wasp nest? The number of wasps a nest may hold depends largely on the type of wasp and the size of the nest. Nests may hold anywhere from 1,000 to 3,000 wasps at a time. 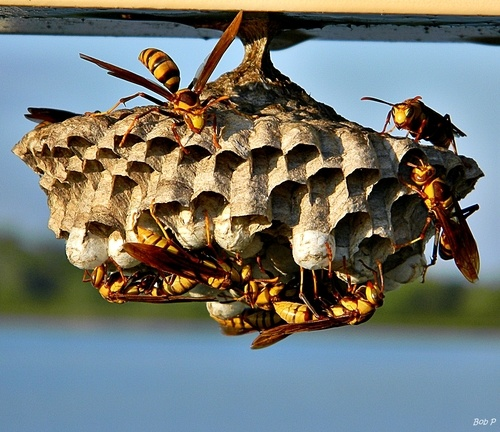 Very large nests may hold up to 10,000 wasps. If the wasps are in the house, it’s best to call a specialist. They will determine the type of wasp, kill them, and remove the nest. If necessary, they may also be able to help with repairs if the wasps have damaged your home. To deal with the problem yourself, consider using a spray-type pesticide designed to kill wasps. Saturate the nest before attempting to remove it. Leaving the nest may encourage them to return, so always take the nest out once the wasps are dead. How much does it cost to remove a wasp nest in my city? Cost to remove a wasp nest varies greatly by region (and even by zip code). To get free estimates from local contractors, please indicate yours. We have also added an image of the project and a summary at the beginning with the cost of the removal of a wasp nest to help the user better understand the project, and an index to take you directly to any part of the guide.